A Banner 2013 ahead... Bet the house on it! It seems like the popular consensus on main street is that the U.S. Economy that has been plugging along over the last 2 years, might actually be on the up swing. All roads seem to lead to a profitable 2013 on all major fronts that include: consumer spending, purchases of durable goods, and last but certainly not least home prices are on the rise. The S&P/Case-Shiller nationwide home price index was up 3.6% from its year-ago level, its second year-over-year gain. The Federal Housing Finance Agency uses different price methodology but came to the same basic conclusion: its third-quarter U.S. price index for purchased homes increased 4.0% from a year ago. The uptrend in prices shows supply and demand are in better balance in both new and existing home markets. Of course, new home construction feeds more into gross domestic product but demand for both types of housing is good for consumer confidence and leads to future home-related purchases such as appliances, textiles and landscaping services. News that home prices are no longer falling are also drawing out more potential buyers–as are record-low mortgage rates engineered by the Federal Reserve. The Conference Board’s November 2012 consumer survey found 6.9% of respondents plan to buy a home in the next six months. While monthly results can be volatile, the percentage has been moving up since last spring. If case studies and reports aren't your thing, then take a look around at your family and friends and ask --how work or business is like for them. When it comes to us "normal" folk the economy is only as good as our ability to pay our bills. Majority of the people I interact with on a regular basis from successful business owners to their employees seem to think that things are going "ok" which seems to be the new "good". It's almost as if the last 2 years have left many of us so battered and bruised that we are just happy that things have not gotten any worse. Over the last 2 weeks alone I have had calls and emails from colleagues with job openings, looking to hire experienced people in accounting and finance that had starting salaries in the $55-$60k range with benefits, while my own small business clients (the segment of business that employ about 75% of the working population) continue to add employees to their staff. What makes that kind of news all the more optimistic is that these particular clients are in the manufacturing and construction industry, both industries that took some of the worst hits during the crisis of 2008. As the price of homes continue to rise slowly in some of the more devastated markets like California and Nevada , with a more balanced demand vs. supply ratio home owners will feel the "wealth effect" of once again having some equity in their homes. The biggest difference now is the old adage of a lesson learned...that your house is somewhere you live not an ATM machine. I would like to wish the small handful of readers of Dollarsintosense a belated Happy New Year - and I hope that your 2013 is off to as good of a start as the news on this blog post! I guess it should come as to no surprise that since starting this blog back in 2010 the most popular post I have had so far (based on comments and page views) was a post about the steps of filing for bankruptcy. It was very flattering to read some of the comments from people all over the country talking about questions they had about the B.K. process being answered on my post. It was also a very disconcerting sign of the times. So as an attempt to balance out the bad with the good, here is a step-by-step process of rebuilding your credit after filing for bankruptcy. Most people who file for bankruptcy are at least $20,000 in unsecured or credit card debt, and have no real way of catching up. Filing for bankruptcy can be a gigantic load off your back and offer a fresh start (well almost). As a basic example someone with an excellent FICO score of 800 with $25,000 of debt who files for bankruptcy due to a job loss or medical emergency can see their credit score dip all the way down to the high 500 to low 600 range, which now makes them a much riskier borrower than they used to be. Here are the things you need to do to get your credit scores back up after wiping your debt slate clean. 1. Put yourself on a very strict budget and do absolutely everything you have to do not to put yourself in the same position again. Remember you can only file for Chapter 7 Bankruptcy (the most common kind) once every 8 years. It’s meant to be a last resort not a free pass on paying your bills. 2. 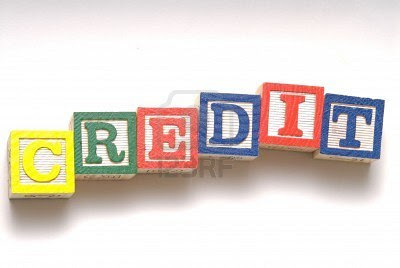 Pay for a credit report 3-6 months after filing for bankruptcy to see where your scores stand. Myfico.com offers a very accurate report along with FICO scores for around 20 bucks. 3. Know the difference between FICO scores and Vantage Scores. FICO scores are what 90% of creditors look at while Vantage Scores are looked at by second and third tear lenders looking for a quick approval with inaccurate and inflated scores. FICO scores range from 300-850 and Vantage Scores range from 500-990. 4. Believe or not, you will be barraged with credit card offers and solicitations after filing for bankruptcy. Creditors know that people with a bankruptcy are desperate to obtain credit cards and circle those who have filed for BK like Vultures armed with pre-approval offers with insanely high interest rates. Apply for a card with a very low limit ($500 or less) and pay off your bills on time and in full every month. This is the number one way to rebuild your credit scores and credit worthiness. 5. Be patient. There is no quick way to rebuild your credit. It will take a good 2 to 3 years to get your credit scores back to a respectable level after filing for BK. Just focus on living within your means and not repeating the same mistakes twice. For those of you dog lovers out there who are familiar with the agony of losing your best friend know all too well how paralyzing and difficult the grieving process can be like. 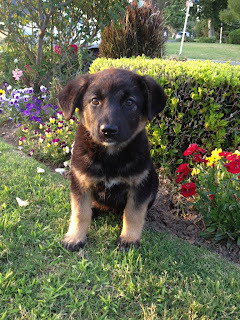 When I lost my beloved German Shepherd to cancer almost 2 months ago, I literally thought I was going crazy. I did everything I could to keep myself busy in an attempt to stave off the tears, whether it was detailing my kitchen and bathroom, painting my dining room, working on my truck or in my particular case all of the above. All the simple things that I enjoyed most felt like a chore without Harley by my side. I barely ate, yet continued to push my running regimen beyond the limits I set earlier this year, because I knew that I had to continue on with my routine, simply out of fear of what would happen to me if I didn’t. Harley was my first dog, and she was also the first major loss I experienced in my life. She taught me so many virtues that I thought I was immune to during our time together and she continues to do so from up above. 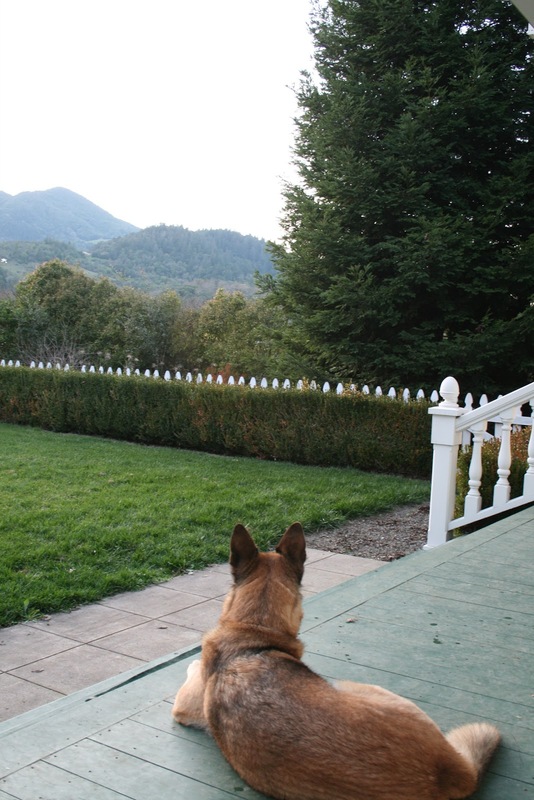 My inexperience with losing such an important piece of my life carried over to the question of: When is the right time to think about welcoming in a new dog? The few people I let console me, who were more seasoned dog lovers themselves gave me the same 2 pieces of advice. 1) It’s one of the oldest cliché’s in the book, but it will get easier over time. 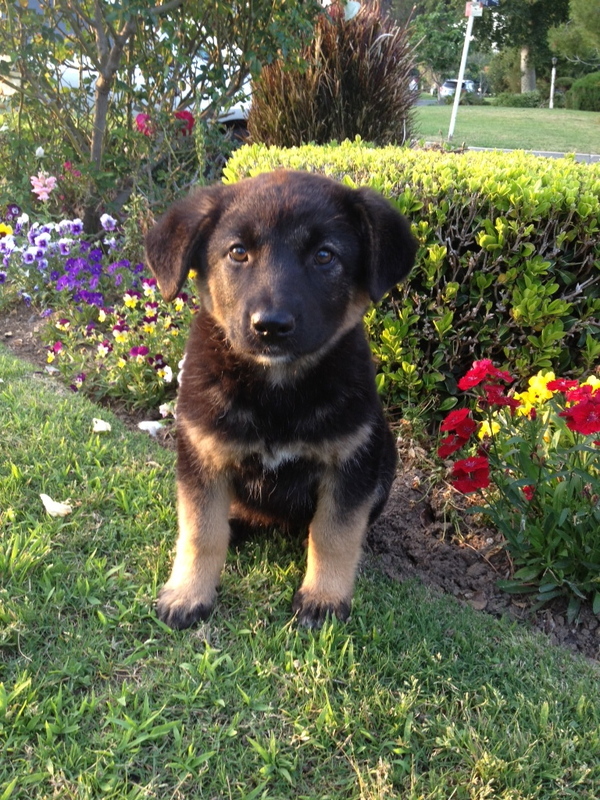 2) Think about getting a new dog. I don’t know whether it was the desperate need to take care of something, or the timing of a friend of a friend’s text message about someone giving away 2 German Shepherd puppies while I was watching “I Am Legend” which also stars a German Shepherd that led me to visit a complete strangers house one Sunday afternoon. I barely knew how to get there, I had no idea what to expect when I got there and came home with a 4-month-old puppy, which I had no idea how to take care of. I found Harley when she was already 3 or 4 years old, so the things I had to learn with a dog that was fully grown and house broken was a far cry from taking care of a 4-month-old puppy for the first time. After the first night I actually dialed the number of the home I got her from, in hopes of begging them to take her back. I went as far as contemplating paying for her food and a much needed vet trip as a way to convince them to let me bring her back, but I didn’t have the heart to hit the SEND button on my phone. I took this little puppy away from her sister, and away from some deplorable living conditions with the promise of a better life, and a promise like that is something that needs to be carried out. As the days passed and the more advice I got, the more comfortable we became with each other. I quickly learned how to “puppy proof” (if there is such a thing) my apartment and read up online on how to train a puppy. I never had a dog before, until I found Harley and that turned out to be one of the best things I ever did. I can only hope that my never having a puppy, until finding Stevie can lead to similar experiences. It’s impossible not to compare the two no matter how unfair it is to do so. Having another dog hasn’t stopped the pain or the tears for those are symptoms that can only be treated not cured. I have to admit, it truly is a treat to see Stevie quite literally growing up before my very eyes and knowing her history and providence in a way that I didn't know with Harley. I swear there are days when I leave in the morning, I come home to a dog that is bigger than she was when I left. I wouldn’t be surprised if she’s grown, just in the time it took for me to finish this blog post. She does so many of the same things Harley used to do. She has a tendency to lay down in all the same spots and picks up pretty quickly in spite of her boundless puppy energy. I don’t know if it’s just a German Shepherd thing, or maybe Harley is somehow helping her to help me. The comparisons between the two of them will never go away, I can only hope to accept and celebrate them over time. All I know is, in order to make this work, I have to open my heart and let her in. -W.S. Merwin U.S. Poet Laurete, written about his departed dogs, his beloved Chows. Just on the heels of receiving a notice of a 3% rent increase from my landlord, along with a disclaimer saying that they will no longer be paying for the Sanitation charges on my DWP bill which averages to be about $45 every two months, I come across an article in today’s LA Times that tempers any frustrations I might have had. Rents are on the rise and vacancies are being snatched up within hours of putting up listings, especially in desirable neighborhoods. 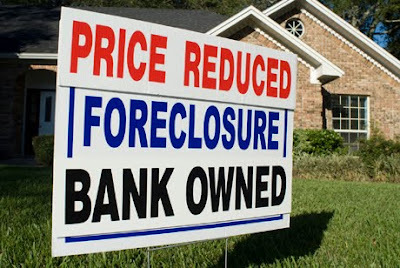 Once again the scales of the economy that have been tipped in favor of the qualified home buyer since the crash in 2008 are leveled off by those who have had to struggle with foreclosures, job loss and damaged credit. For those of you out there who have been renting for a while and like your place and neighborhood but felt like there might be some better deals out there, think again. After reading this article by Alejandro Lazo of LA Times, I went from “really liking” my 1 bedroom apartment in an 8 unit complex with friendly neighbors and a shared courtyard to “absolutely loving it”, regardless of the 3% increase. May 5, 2012, 8:09 p.m.
A nation still struggling to clear up one housing debacle has run smack into another — soaring rents. The foreclosure mess has pushed millions of former homeowners with tarnished credit into a competitive apartment market across the U.S. Add fresh demand from young workers, few new units and tight standards for home loans, and the result is rental sticker shock not seen in years. Rents are surging from New York to Los Angeles. The average monthly U.S. rent for apartments hit $1,008 in the first quarter, pushing past the all-time high set in the third quarter of 2008, according to the data firm RealFacts. USC's Lusk Center for Real Estate forecasts a 10% jump in Los Angeles County rents over the next two years. In certain markets, it is now cheaper to own a home than rent. Menachem Krinsky of Hancock Park recalls how in late 2008 every street seemed ornamented with "for rent" signs when he first moved to Los Angeles from the East Coast. Back then, his landlord was so desperate to keep him as a tenant that he slashed his rent of about $2,000 by $800 after Krinsky's first roommate bailed on the lease. These days, however, Krinsky's search for a one-bedroom apartment costing around $1,500 is shaping up to be a major headache. "I am looking for something clean and new, and unless you want to spend a fortune, it's hard," said Krinsky, a 22-year-old art director and graphic designer. Units that years ago would have languished for weeks are snapped up in days. The Santa Monica-based listing service Westsiderentals.com is operating 14 hours a day to meet demand from renters. The company has even seen a bump in interest for its "platinum" relocation service, which offers to chauffeur clients to various Southern California listings. Ellie Balderrama, who lists properties in Los Feliz, Silver Lake and Atwater Village for TheRenterGirl.com, said that as many as 20 people have showed up at some of her open houses. The ones who win arrive with completed rental applications and deposits in hand. "In L.A., people have gotten so used to how relaxed it was, they are not aware how competitive it's become," Balderrama said. "Some people have got it, and some people don't, and the ones that don't suffer." Rob Magnotta, a real estate agent, recently listed his two-bedroom Irvine condominium for rent on Craigslist for $2,300. He had six applicants within 24 hours, including one who wrote a poignant letter about losing a home to foreclosure. "It was almost too easy," said Magnotta, who chose another renter. "I know the rental market was strong. But until you are actually renting the place, I think you are surprised it is that strong." 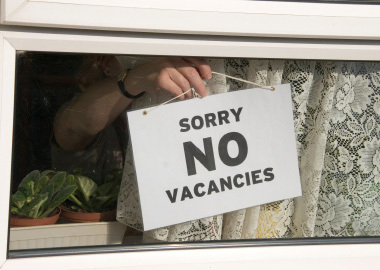 A big driver of rent increases has been demand from young workers who are striking out on their own after doubling up with family members during the worst of the economic downturn. Alaia Williams, 27, recently moved out of her mother's Inglewood apartment to be nearer to her job at a Santa Monica tech start-up. She and a roommate are splitting the $1,400 rent on a two-bedroom apartment in Palms. "We can't afford to live" closer to work, she said. People who've lost their homes to foreclosure or short sales are also feeling the sting. Damaged credit means many must pay a premium or put down a bigger deposit to secure a place. Robert Corlette pays about $1,700 a month for a two-bedroom town house in Anaheim Hills that he shares with his wife and five children. The family lost their home to foreclosure in 2009 after Corlette lost his $75,000-a-year job selling insurance. His current job, also in the insurance industry, pays about half that. "There is a lot of pressure," said Corlette, 56. "It wears you down." The crash has made owning a home more affordable than renting in some markets. An index by the research firm Green Street Advisors compares buying with renting in 79 metro markets; that index hit its most attractive point last year for buying since 1991, when the firm began tracking the data. Researchers calculate that the after-tax cost of a mortgage is only 10% higher than what it costs to rent nationally after taking into account mortgage rates, property taxes and other factors. Orange and Los Angeles counties remain more expensive for buyers than renters, though that gap has narrowed, according to the index, while owning a home in the Inland Empire is now more affordable than renting. Rising rents have converted some renters into buyers. Scott Matulis, 48, recently purchased a town home in Oak Park after enduring two consecutive years of rental increases. His mortgage, taxes and homeowner association fees now total $2,200, just $100 more than what he was paying his former landlord. "I finally just pulled the trigger and figured I'd be throwing money away on rent," Matulis said. Although rising rents may be motivating home purchases by people who are in good shape financially, those increases are walloping working class families and the poor — groups already hard hit by job losses, lost income and stagnant wages. Marisela Alfaro has lived in the same one-bedroom Santa Ana apartment for 28 years. A large bed sits in her living room, where she and her husband sleep; their teenage daughters share the bedroom. Modest religious art adorns her carefully kept home, but outside Alfaro's door the building is in disrepair, with tattered screens, broken lights and graffiti. Alfaro said the family pays $820 a month and feels lucky to have the apartment. "There are other places that cost much more," she said in Spanish. "It's been difficult because my husband works in the fields, and that's the lowest salary that there is, and if there is no rain, there is no work." Even for those with better jobs, paying rent can be difficult. Virginia Villa of Brea, a single mother of four who works as a manager at Disneyland, has doubled up with her adult daughter, who contributes $400 to the monthly household budget. Still, Villa said, about half her take-home pay goes toward rent and utilities. "I have a decent job and I would love to buy a house, but I don't think that's possible to do," Villa said. "In O.C., it's even difficult to find a substantial apartment or especially a house to rent — the rental cost for houses is really high." As I sit here to write about you, I just realized that this is going to be my first blog post without you by my side or under my feet. All I can do is look around my place and see all of your favorite spots empty. I knew that this day would eventually come, but I had no idea it would come so soon. Even when you were first diagnosed with Lymphoma I was reminded of your precious mortality but found comfort in your unbelievable courage and resolve. You were such a big part of my life Baby Girl, everything I did revolved around you. My schedule, what kind of car I bought or the place I lived in was built around us not just me. My only regret is that we didn’t find each other sooner. Our four-year anniversary was just a couple of weeks away but you had other places that you needed to go to. A place where you can find peace, free of pain, free of chemotherapy, free to run around in knee high grass that you can push your nose and face through. You always loved the way overgrown grass would brush up against your face. We went through so much in such a short period of time. You were my first dog and you were so very patient with me as we got to know each other, I am so sorry for the times when I was mean to you, I simply did not know any better. I always hear people say that dogs have short-term memories and don’t hold grudges. I disagree, I think dogs have perfect memories; they never forget they simply always forgive. In all of the thousands of walks we must have been on, never, ever was it a chore for me. No matter how early or how late, walking with you was something I always looked forward to. I am trying to keep myself busy, love… but it’s so hard. Just yesterday I finally got some curtains for our room so the lights from the parking garage wouldn’t shine so brightly through the windows at night…I installed them as soon as I got home and wished that I had taken longer. My mornings and nights are so empty without you. Coming home and sliding my key in the front door without hearing you on the other side is a silence that crushes my spirit. Every move I make I await your reaction, every time I grab my car keys I wait for you to run to me, every time I go to the kitchen to get something to eat, when I turn around you are not there anymore and I miss you so very much. All I can do is try to look back on how greatly you touched my life and how you have forever changed me. As of right now any laugh or smile that I can muster is anchored by the weight of losing you. I have to let myself grieve and hope for the time when my days are no longer filled with your absence. Your paw prints are all over my heart and I will never forget you. Thank you for blessing me with our time together, however brief. I love you so much Harley Girl, until we walk together again. Great time to buy, bad time to qualify. I am convinced that, 5 years from now I, along with a lot of other folks out there will look back at 2011 thru 2012 and want to give myself a swift kick in the (you know what) for not taking advantage of today’s still semi-distressed housing market. Houses that ballooned to near 7 figure prices in very modest neighborhoods can now be purchased for less than half of what they commanded during the boom years. I’ve heard and read many times over of investment firms pooling together hundreds of millions of dollars in special funds designed to buy up residential properties by the hundreds, and why not? If you’ve got the cash you can purchase a “move –in” ready home and rent it out at a profit every month. To give you an example: I recently came across a bank owned 1 bedroom townhome in a decent area in the northwest San Fernando Valley with a garage, balcony and in unit washer/dryer for sale for $69,000. Do the math with the minimum FHA requirement of 3.5% down along with a $199/mos in home owners association dues your mortgage would be in the $700 a month range with a cash outlay of only $3000. A place like that can easily garner between $900-$1100 a month giving you instant positive cash flow, while capturing appreciation in value and getting the mortgage interest tax deduction on your tax return. Sounds easy, if you’re lucky enough to be sitting on piles of cash or if your credit score and history are pristine. Once upon a time all you needed was a pulse to qualify for a home loan, now it seems like the only thing banks haven’t done to measure your credit worthiness is to draw blood and urine samples. Getting a home loan approved nowadays takes not only having all of your ducks in a row; you need to have the right kind of ducks as well. Here are some important factors you need to know before you start looking for that 3-bedroom diamond in the rough. •A FICO credit score of 764. Not only is this higher than the average score for approved loans as recently as November, it's far beyond the 620-640 FICOs that Fannie Mae and Freddie Mac once considered the minimum for a conventional prime mortgage. It's also well above the median FICO score nationwide, which is currently 711, according to the Fair Isaac Corp, developer of the score. •A loan-to-value (LTV) ratio of 78%, signifying a down payment of 22%. This is higher than even the controversial minimum of 20% proposed last year by Obama administration financial regulatory officials who were seeking a standard for "safe" loans offering the lowest available rates and best terms. •Debt-to-income ratios of 21% for housing expenses, 34% for total household monthly debt. How about the profiles of people who applied for conventional loans to buy a house but were rejected or didn't get to closing? By historical standards, they were a fairly impressive group on average as well, with 732 FICO scores, 19% down payments and debt-to-income ratios of 24% (housing costs) and 41% (total debt). Homeowners who refinanced existing conventional loans had the best profiles of all: average 770 FICOs, 65% LTVs indicating 35% equity stakes, and debt-to-income ratios of 22% housing and 32% total debt. There is an alternative thought process out there. 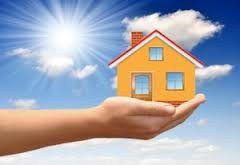 One could always try to qualify for the previously mentioned FHA (Federal Housing Administration government sponsored loan) which lowers its standards in an effort to make “The American Dream” more equitable. And, remember these are just averages, if you are in the ballpark of some of these impressive figures and standards you still have a good chance of qualifying since each bank or lending institution has their own standards to adhere to as well. For years now myself along with a couple of fellow gear heads have been exchanging, mostly via text-message... random “Which would you rather have?” car questions in an attempt to pass time during the day or when prompted by seeing a car on the road that catches our eye. The comparisons would run the gamut from the more obvious exotics like "What would you rather have a Porsche 911 Turbo or an Audi R8 V10?" to "A Ford Focus SVT or a Honda Civic SI? 1.Cool Factor- how the car looks, the originality of the styling and how well it ages. There are certain models that come out every now and again that have the rare ability to capture both present day design along with combining pedigree and classic sensibility that can make the look of a particular car timeless. 2.Performance- it’s not just a number. Too much horsepower is rarely something to complain about, but there’s a lot more to the overall performance of a car than just raw power. How a car harnesses that power is just as important, if not more so. 3.Emotion- forgive me if this comes off as overly dramatic, but for the true “car guys” out there who can identify a make and model of a car at night by only looking at how the headlights are configured knows that having an emotional attachment to a car is no exaggeration. Drive a particular car for a long enough time, especially in L.A. and it becomes a part of your identity. You develop an attachment to it, how you feel when you are in it, and how you feel when you are seen in it are emotions that don’t apply to other things we use everyday. A car, in some instances can be our first impression. Here are 3 used, but very cool cars that cover all 3 standards in spades and are obtainable without having to be part of America’s top 1%. 2006 Audi S4 Sedan or Avant Station Wagon 4.2L V8 340 BHP All-wheel drive, available 6-speed manual gearbox: price range $18,834-$21,000(depending on mileage) – I have always been a big fan of Audi’s and especially the S-line models. 2006 being one of the first years when the new re-designed single A-frame grill was introduced. 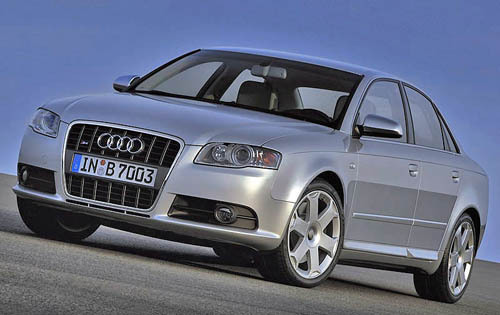 Audi’s famed Quattro technology that dominated the Rally circuit back in the day makes the Audi S4 the perfect car for the Junior Executive seeking performance and style, but doesn’t want to join the herd of the 3 Series Bimmer sect. It feels at home pulling up to the valet at the latest tapas bar, or for the weekend warrior driving pass cars on the side of the highway putting on chains on snow covered terrain. I personally would opt for the Avant model, which gives you more room for Rover, because what’s the point of a weekend adventure if you can’t take your dog with you? PROS: Great performance and luxury both inside and out. Audi’s interior is second to none when it comes to luxury cars, and it shows, even on lower end models. A more subtle and grown-up feel to its BMW M3 counterpart. CONS: V8 performance comes at a cost at the pump. Maintenance can be on the pricey side. 2002-2004 BMW M5 Sedan 4.9L V8 394 BHP rear wheel drive 6 speed manual gearbox: price range $14,700-$20,900 (depending on mileage). This car was the standard of full-sized sports sedans when it came out and still commands the same kind of respect to this day. This car was not designed for soccer moms or boy racers. It’s as serious of a sports sedan as they come, so serious in fact that it was only available in manual transmission between 2002 and 2004 and unless your last name was Schumacher you were implored by the dealership to never ever disable the traction control out of fear of hurting yourself or others. PROS: Very roomy, sits 4 adults comfortably and has a relatively pleasant ride at normal speeds. Being seen in one gives the driver a sense of pride without the Duchebag factor that came in subsequent models. CONS: Can be hard to find and the Interior is a little dated. Opting for the polished aluminum rather than the wood trim helps. 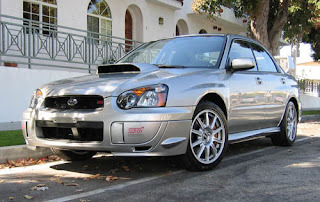 2005 Subaru Impreza WRX-STi-sedan 2.5L 300 BHP 4 cylinder turbo all-wheel drive 6-speed manual gearbox: price range $14,299-$16,500 (depending on mileage). This car is by far and away the most practical choice of the 3. Its signature Boxer engine does more with less and is legendarily reliable. All models come with all-wheel drive making it the perfect sports-utility vehicle without being a gas guzzling SUV. Subaru was Eco-conscience before it was trendy and the WRX is like a bull in a China Shop that cleans up after itself. PROS: Very affordable and reliable. Good gas mileage with A LOT of bang for the buck. CONS: Boy racer looks reminds you that you’re way too old to be wearing skinny jeans and Chuck Taylors.